Adult Catholics have many questions such as: What is the Church’s doctrine on communion for married Catholics who after a civil divorce have entered into a second union? Is Jesus truly present in the Holy Eucharist? What is wrong with IVF? These and many other questions that confuse Catholics indicate the need for deeper adult faith formation in our country and throughout the world. The degree of misinformation about religion and society has only increased with its easier access via cyberspace networks. So often writers misquote Cardinal Newman “to grow is to change” without conveying what his understanding of growth in continuity. Catholics are swayed by beliefs and practices that are contrary to the faith which many try to pass as authentic Catholic teaching. John Henry Newman (1801-1890), English convert from the Anglican to the Catholic Church, whose feast day falls on October 9th, could be considered the patron of adult faith formation, as I propose below. Newman lived in a nineteenth century England which was marked by modern technological development and an industrial revolution – with a consequent rise in materialism and atheism. He understood well the materialistic and relativistic culture, which is why he is able to speak to our times. He also defended the harmony between faith and reason that is so much lacking in our society. Our times prides itself in scientific advances and looks to science almost as a god. Like St. Josemaría Escrivá and St. John Paul II, he taught lay people to strive for holiness in their work and daily pursuits, whether in universities, factories or fields, finding the harmony between faith and reason. 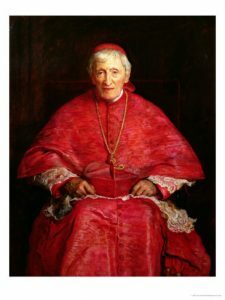 Blessed Newman, beatified by Pope Benedict XVI on September 19, 2010, offers us a deep understanding of the Church’s tradition, teaching office and true development of doctrine, countering the prevalent and simplistic approach to growth in doctrine. With regard to change, or what he called development in doctrine, he wrote: “(It) is indeed sometimes said that the stream is clearest near the spring. Whatever use may fairly be made of this image, it does not apply to the history of a philosophy or belief, which on the contrary is more equable, and purer, and stronger, when its bed has become deep, and broad, and full.” He explained that, for this to happen, authentic development must be in continuity with the past. Newman is the person to whom we can turn for developing a better program for adult faith formation (RCIA) and continuing education, especially in parishes, but also at Newman centers in our universities. When adults really study and learn about the faith they discover its beauty and inner logic; they are motivated to go deeper, and they become capable of transmitting it to their children and co-workers. Knowledge of the faith is attractive and engaging. It leads to a growth in friendship with Christ. As a result we are able to evangelize and to teach it to family and friends. Newman had many friends and cultivated friendship with people, and he realized that through genuine friendship one can have a healthy influence on others. The study of the Catechism and the Gospels in parish adult formation can be supplemented with some selections of Newman’s writings on the Trinity, the Incarnation, the Scriptures, the Sacraments, as well as on the moral life taken from some of his books such as Development of Christian Doctrine andGrammar of Assent. His novel Callista, about a young third century Christian convert, serves as a moving example and guide for apologetics today. In it we can see how the heroine is attracted to Christianity by a deep desire for happiness. Soon she begins to read the New Testament, discovers the person of Jesus Christ, and starts to listen to her moral conscience speaking to her of right and wrong. The Church’s doctrine makes things clear for her, and in the sacraments, especially the Holy Eucharist, she finds union with her new Love. Adult faith formation and continuing education should include the study of the lives of saints, and their writings. It should also include Church history, for example, The History of the Church by Peter Armenio (from the Didache series). For more detailed studies there are the works of Philip Hughes or Christopher Dawson. But accepting the Church’s moral teaching requires more than doctrine, or better a doctrine that becomes part of one’s life. Christian formation is a path that entails growth in virtue and the habit of daily prayer. The writings of saints like St. Theresa of Àvila, St. Thérèse of Lisieux and St. Francis de Sales are fundamental guides along this path. Here, too, Newman serves himself as a guide. In addition to his sermons, in particular the Parochial and Plain Sermonsfrom his Anglican period, he offers beautiful mediations and prayers composed as a Roman Catholic (Meditations and Devotions). Just as there are patrons for all types of endeavors we need a patron for adult formation, and Blessed Newman is just that person. However, first he would need to be canonized – which we hope will take place in the near future. In the mean time, the United States bishops could obtain permission from the Holy See to celebrate throughout the country the memorial Mass each year on his saint’s day, October 9.